Suspected Muslim militants remotely detonated a bomb near the entrance of a mall in the southern Philippines on Monday as people did last-minute shopping ahead of New Year's Eve celebrations, killing at least two and wounding nearly 30, officials said. "This is a part of the retaliation, but the problem is they're victimizing innocent civilians," he told reporters. Supt. Romeo Galgo Jr., the deputy police director of Cotabato, said witnesses saw a man leave a box in a crowded area near the mall's entrance where vendors and shoppers were milling. The explosion shattered glass panels and scattered debris to the street fronting the mall. 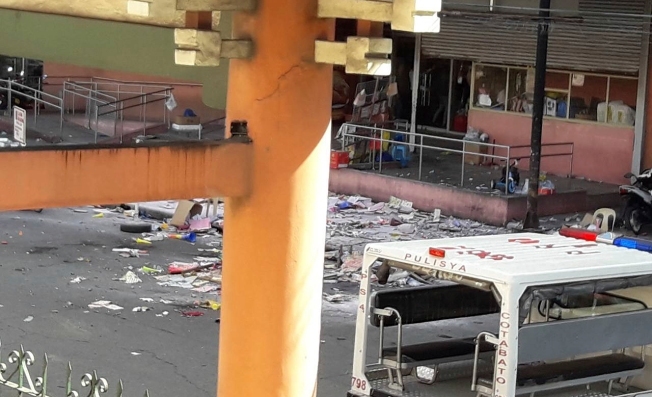 Two of the roughly 30 people hit by the blast died while being brought to a hospital, Sobejana said. Cotabato Mayor Cynthia Guiani-Sayadi condemned the bombing and called on residents to help fight terrorism. "This is not just another terroristic act but an act against humanity. I cannot fathom how such evil exists in this time of merry making," she said. "It is unimaginable how some people can start the new year with an act of cruelty but no matter how you threaten us, the people of Cotabato are resilient. ... We will stand up against terrorism," she told reporters. The bombing, the latest in a number of attacks blamed on militants in the volatile region, occurred despite on-and-off military assaults against pockets of militant groups operating in the marshlands and hinterlands not far from Cotabato and outlying provinces. Hundreds of militants aligned with the Islamic State group laid siege in the southern Islamic city of Marawi in May last year, sparking five months of intense fighting and military airstrikes that left more than 1,100 mostly militants dead and displaced hundreds of thousands of villagers. President Rodrigo Duterte placed the southern third of the country under martial law to deal with the Marawi siege, the worst security crisis he has faced since taking office in mid-2016. The militants are opposed to a Muslim autonomy deal signed by the biggest Muslim rebel group and the government. There are concerns that radical groups may carry out bombings and other attacks to derail a Jan. 21 regional plebiscite aimed at obtaining public approval of a new law establishing a more powerful Muslim autonomous region in the south.